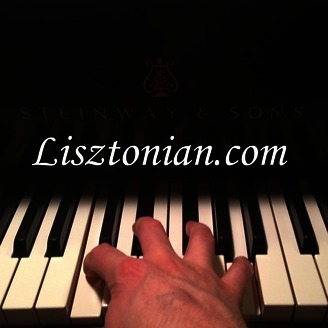 Lisztonian provides free classical piano music from popular composers and works. All recordings are free to download and enjoy without ads or memberships. Recordings include works from the following composers: Franz Liszt, Johann Sebastian Bach, Sergei Rachmaninoff, Frederic Chopin, Robert Schumann, Moritz Moszkowski, Ludwig Van Beethoven, Aram Khachaturian, Franz Schubert, Gabriel Faure, Wolfgang Amadeus Mozart, Modest Moussorgsky, Edvard Grieg, Claude Debussy, Felix Mendelssohn, Cesar Franck, John Field, Mikhail Glinka, Alexander Scriabin, Johann Strauss, Jr., Isaac Albeniz, Stephen Heller, Muzio Clementi, Alexander Goedicke, Johann Friedrich Burgmuller, Samuel Arnold, Edward MacDowell, Johannes Brahms. Please consider signing my piano at SignMyPiano.com! Here is a complete listing of the works currently available: To a Wild Rose, Cantabile, Op. 100 No. 2 - Arabaseque, Moonlight, Ecossaises WoO 83 - Serie 25 No. 302, Invention No. 1 in C Major, Sonatina Op. 36, No. 1, Excerpts from Hungarian Rhapsody No. 2 in C Sharp, Well Tempered Clavier: Prelude in C Major Original Version, Etude in C-sharp Minor, Op. 2, No. 1, The Separation, Waltz in C-Sharp Minor, Op. 64, No. 2, Minuet in G, L adieu Valse - The Farewell Waltz, Fur Elise or For Elise, Fantasy Impromptu in C# minor, Songs Without Words - Duetto, Pathetique - Patetica 2nd Movement, Impromptu Op. 90 (D. 899) No. 2 in E-flat, Nocturne in E-flat Major Op. 9 No. 2, Serenada, Two Arabesques for Piano, The Prelude - The Bells of Moscow, Arietta, After a Dream, Dreaming, Revolutionary Etude, Foreign Lands and People - from Kinderszenen, Impromptu No. 4 in A flat Major, Jesu, Joy of Man\'s Desiring, Liebestraume - Dream of Love - Love Dreams, Moonlight Sonata 1st Movement, Military Polonaise, Prelude in A Major Op. 28 No. 7, Ave Maria, Raindrop Prelude, Prelude in E Minor Op. 28 No. 4. I almost forgot about this one! The tenth in Burgmuller's set of 25 etudes for piano - I forgot I had recorded this one along with the previous nine and just came across it. This etude (exercise) is intended to provide technique for repeated notes played by independant fingers. It's short and sweet.